How about playing sports on my lawn? CAN I PLAY SPORTS ON MY ROYAL GRASS® LAWN? Artificial grass sports fields were specially designed for that purpose. Football, for instance, requires a different type of grass than tennis. Sports grass does not necessarily have to look natural and can even be blue or orange in colour. 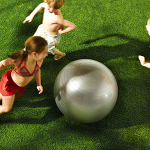 Royal Grass® artificial grass was developed for decorative purposes. Of course, you can play ball games on it if you like, or have your children romp around on it, but Royal Grass® is not suitable for official sports purposes. This has to do with the requirements that playing fields have to meet. PreviousPrevious post:Artificial grass pricesNextNext post:Will the artificial grass remain green? Will it discolour (fading)?